Relevance TAT-C3 (PTD) consists of the Clostridium botulinum C3 exozyme (C3 ADP-ribosyltransferase) linked to an HIV TAT PTD (Protein Transduction Domain) leader sequence that permits transduction of the protein across the plasma membrane. HIV TAT PTD is a further optimised version of TAT-C3; catalogue code 152719 (see related product). The cell penetrating moiety allows rapid and efficient transport through the plasma membrane. Once in the cytosol, the cell penetrating moiety is released, allowing C3 Transferase to freely diffuse intracellularly and inactive RhoA, RhoB, and RhoC, but not related GTPases such as Cdc42 or Rac1. 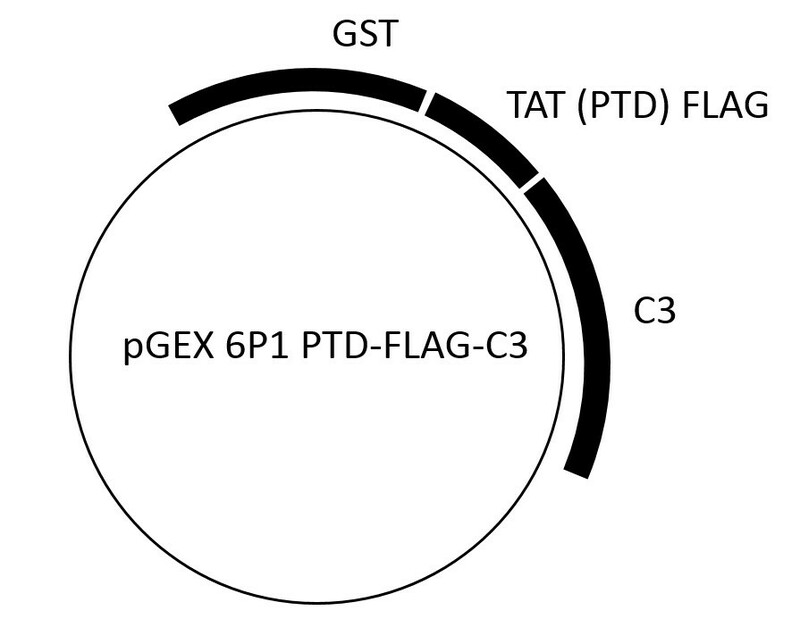 TAT PTD is fused to a single copy of the FLAG epitope tag. The Exoenzyme C3 Transferase from Clostridium botulinum is commonly used to selectively inactivate the GTPases RhoA, RhoB, and RhoC, both in vivo and in vitro. C3 Transferase inhibits Rho proteins by ADP-ribosylation on asparagine 41 in the effector binding domain of the GTPase. TAT-C3 (PTD) can be used to inactive Rho proteins in fibroblasts, neurons, epithelial, endothelial, and hematopoietic cells as well as other primary and immortalized cell lines. Boomkamp et al. 2012. Glia. 60(3):441-56. PMID: 22139636. The development of a rat in vitro model of spinal cord injury demonstrating the additive effects of Rho and ROCK inhibitors on neurite outgrowth and myelination.